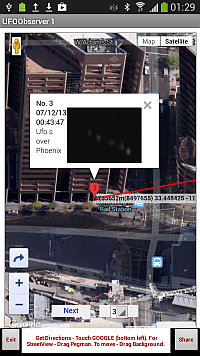 Example Of Sites To Send Your Observations. Now Here, The Latest Upgrade v1.0.21. a/ Goto Latitude and Longitude Co-ordinates For Map. 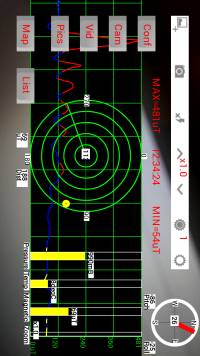 b/ Display Present Position (Lat/Long/Address) And Accuracy. d/ Switch Between Statellite And Road Map View. e/ Switch Sensor Display On/Off. f/ Export/E-Mail The Details Of Your Database in CSV/XML Format To View In A Spreadsheet. 2. Press the Menu button on the SENSORVIEW SCREEN to display the Alarm/Warning threshold values in uTeslas. Enter new values and press Save. Remember that Normal values in uTeslas are around 35 - 75 uTeslas. This may be higher if your mobile phone is in a case with a magnetic clasp . 3. If the magnetic reading (in uTeslas) is very high in normal conditions, then reset the magnetic sensor by holding the phone firmly and rotate gently in a figure eight pattern. This also has a new SENSORVIEW SCREEN with a realtime colour coded trace of the Magnetic Field on a grid as well as the Directional Radar view, with MAX/MIN/TIME stamped recorded MAG FIELD strength signature. It has Alarm Sounds indicating when the Magnetic field reaches certain thresholds. Plus a new Filter Search feature on the Database LISTVIEW SCREEN. 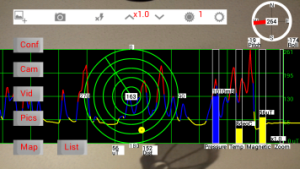 FOR EXAMPLE - the left hand magnetic trace below was obtained by moving the App around a laptop, with the RED peaks appearing where the Wifi Antenna was, in this case at the top of the screen. Try it, but not too close as the measurement (in micro Teslas) can go from normal background values ie 50 uT, to OVER A 1000 uT. This is a TESLA based unit App in recognition of TESLA'S genius. To convert to Gausse use the following conversion. More Examples Of Sites To Send Your Observations. 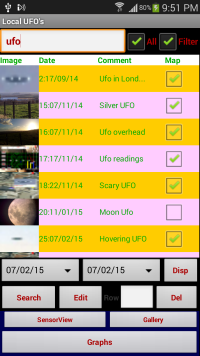 This App enables you to take and store pictures/videos of UFO's/Unusual Phenomena together with the Magnetic Field Strength, Atmospheric Pressure and Temperature data. 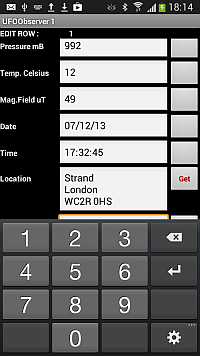 It is a Fully Configurable Multi-Data Base Collection App. When the App starts, there are 7 separate databases to chose from. 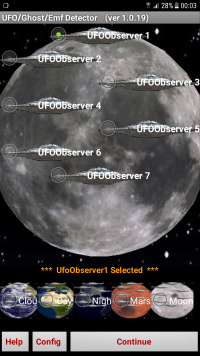 UFOObserver 1 to UFOObserver 7. Each Data Base has 20 fields, 12 filled automatically by the system ,eg Location,Mag Field Strength etc , and 8 fields plus the name of the Data Base that can be named and filled in by you. This is done by pressing the Config Button on the intro screen. 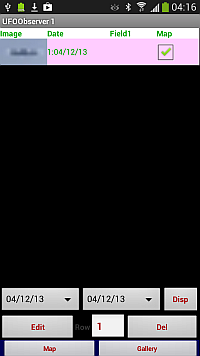 To begin, press Continue, this will use the selected UFOObserver X database and display a message indicating the database being used. 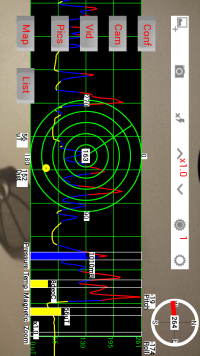 The SenSorView screen is now displayed as shown below. 1. Conf - Configure selected Database Headings and Fields. 4. Pics - Picture Gallery. 5. 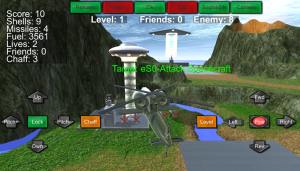 Map - Map Screen. 6. List- List of all pictures taken. 1. Touch to set Camera Zoom Level. 2. Pressure Level (milli Bars). 4. Magnetic Field (micro Teslas). 5. Radar Back Display On/Off. Touch Pin to display picture. Touch outside picture to clear it. 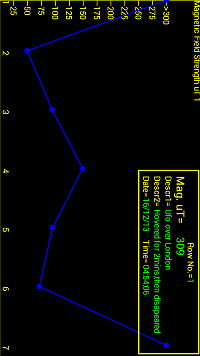 and Magnetic Field level values. Version v1.0.5 has new buttons, Cam(Camera) and Vid(Video) on the SENSORVIEW SCREEN , to enable Pictures and Videos to be taken by the phones Camera. 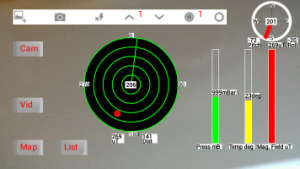 A Screen Grab can still be taken by pressing the Camera Icon on the top control bar of the SENSORVIEW SCREEN. This view can be used to detect and take pictures of areas with unusual Magnetic Field Strength/Temperature/Atmospheric Pressure values. The screen grab on the left, taken by pressing the camara icon, shows a normal background Magnetic Field Strength of 48 micro Teslas (background varies from 30-60 micro Teslas). The picture on the right indiates an unusual value of 269 micro Teslas and hence is coloured red. 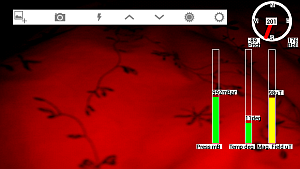 The first button on the control bar toggles between normal,red and green Camera Views. The Red and Green at the moment act as filters but will soon be converted to Infra-Red and Night Vision views. The Magnetic Field Strength in both is elevated but not completely unusual and so are coloured Yellow. Note that the Radar in thoe pictures has been turne OFF by using the Menu selection for Radar. 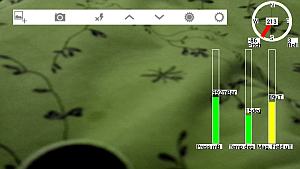 The second button on the control bar takes a picture, and as before stores the image and all the associated data. This will then return you to the Map screen displaying a new red pin. Touch the pin to display a thumbnail of the picture taken if it is not already displayed. The other buttons on the control bar are Flash On/Off, Zoom In, Zoom Out, Increase Brightness and Decrease brightness.Turning on the Flash, resets the brightness level to normal. 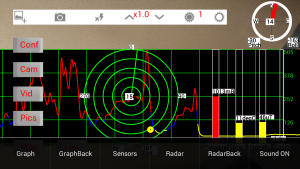 To view stored readings in graph form, press List button on the SensorView Screen then select Graphs. 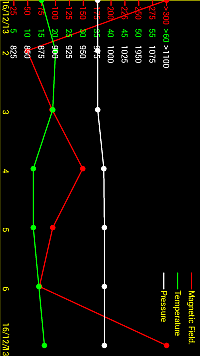 To display the contents of a point on the graph, touch that point, and the information relating to the point will display in the Information Window, at the top right of the screen. NOTE: This ONLY appies to the individual graphs, NOT to the ALL GRAPH display pictured on the left above. 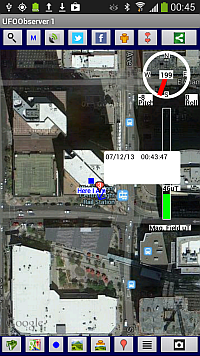 To take pictures in MapView, press the Map button on the SensorView Screen to display MapView Screen, which depicts a Map and your position on it. To take a picture/video press the Camera icon (the last button on the bottom row). 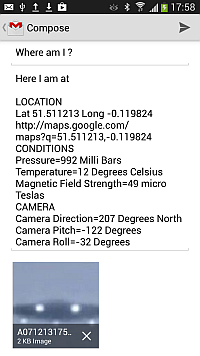 When the picture/video was saved it also stored Date,Time,Geo Location,Compass Direction,Camera Elevation/Tilt, Magnetic Field Strength, Atmospheric Pressure and Temperature data. This can be viewed in one of two ways. One is to touch the picture, which will take you straight to the Edit Item screen. Two is when the picture is not displayed, to press the List button (next to the Camera button) which takes you to the list screen. Touch the required row and press Edit. As you scroll through the screen there are boxes already automatically filled in when the picture/video is taken. Fields 1 to 9 are available for you to enter information. The contents of Field1 are diplayed on the thumbnail picture on the Map screen. 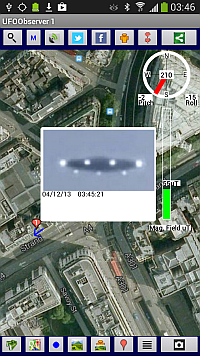 eg if you entered "UFO over central London" then this text will appear on the image window for that pin. 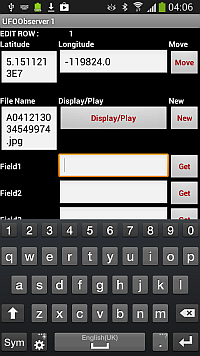 Fields 1 to 9 can be renamed by you using the Config Utility in the Map screen menu. 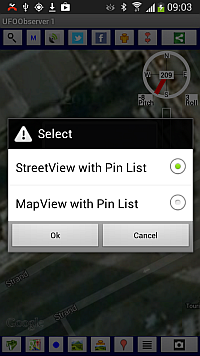 To display the Pictures in Street/Map Views press the 5th button on the bottom row, then chooose between "StreetViewn with Pinlist" or "MapView with PinList". 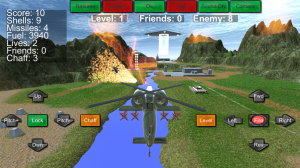 Selecting the first choice will display the first screen below,and selecting the second choice displays the second screen below. 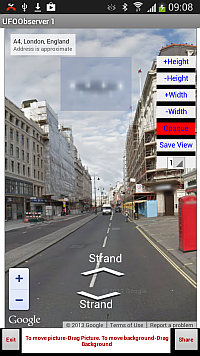 The first screen superimposes your picture on Googles SteeetView at the location it was taken. You can move/resize the image and then Share it by pressing the Share button. You can select the pin to be viewed from the drop down selection box. 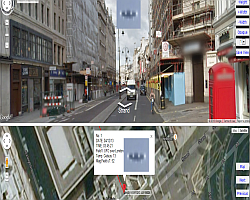 The second screen superimposes your picture on Googles MapView at the location it was taken. displaying the image in a window with the contents on Field1 from the Edit function. I also displays the distance rfom the previous picture and the total distance from the first picture taken (in brackets). The latitude and longitude of the picture are also shown. It can also be shared by pressing the Share button. 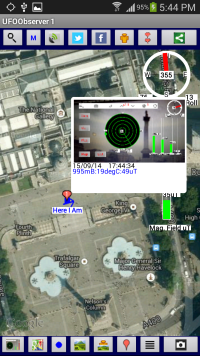 Dragging the Yellow Pin Man onto the amp also displays StreetView showing the Pin at the location the Picture was taken, Touching the pin takes you back to the Map View. Your pictures can be shared in any screen that displays the Share Icon or has a button displaying Share. 1. 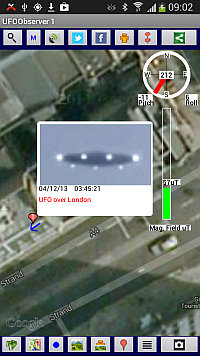 Display your list of sightings, select one and press Edit. Select Display/Play then Image View. You will now see the Share Icon. Pressing this displays the following screens. 2. 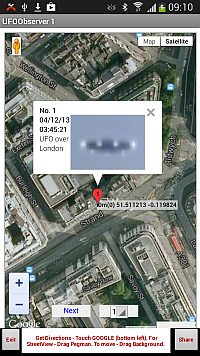 Display the Picture Gallery, using the Pics button in Sensorview or the Gallery Icon on Map View. Touch a picture and press Display. Then select Image View. You will now see the Share Icon. Pressing this displays the following screens. Your pictures can be shared using all of the methods shown above. 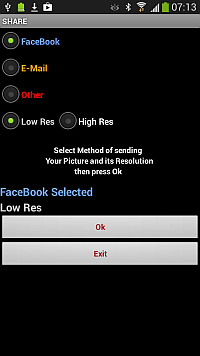 You can chose between Low Res or High Res picture sharing (.png or .jpg). 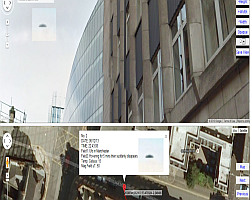 The E-Mail option will also tranmmit the associated data for the Image, including a link to Google maps to precisely display its location on Google Maps. You can modify the displayed text and add your own comments if you wish. 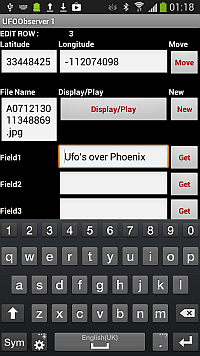 Now press new and select your Phoenix lights picture form your gallery and press save. Select the E-Mail Database option from the LIST Screen menu, Select Image Types and Line Numbers from the screen to Attach To The E-Mail then press OK.
All the contents of your selected database can be E-Mailed to a PC (except some Videos due to size) for viewing using the STREETVIEWmod.html/MAPVIEWmod.html viewers included with the files E-Mailed. 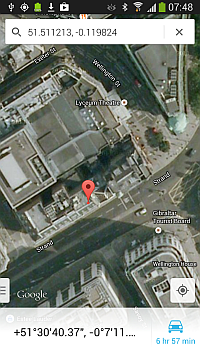 NOTE - rename to STREETVIEWmod.hta/MAPVIEWmod.hta for viewing in INTERNET EXPLOPER. The E-Mail also includes your Database in CSV format for integration into an existing Database or Excel Spreadsheet. 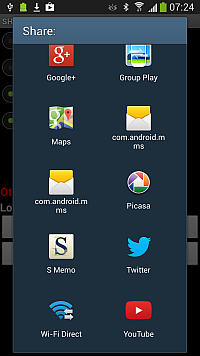 When the E-Mail is recieved, extract it into a folder then to view it. 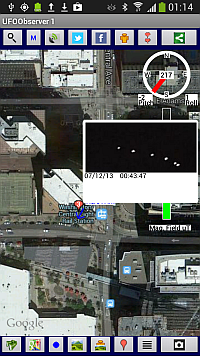 The image above shows the first picture, pressing Next on the Mapview will display the subsequent pictures. Associated recorded data and comments will also be shown in the image window.